When Should Children Visit An Orthodontist? 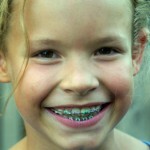 Let’s address a common question parents in Houston TX have when considering orthodontics for their children. “When is the best time to have my child evaluated by an orthodontist?” Before you begin researching…orthodontist Dr. Amir Davoody would like to answer that question for you. The American Association of Orthodontists recommends that your child be examined by an orthodontist at age 7 to determine if early orthodontic treatment is needed. To become an orthodontic specialist, it requires an additional 3 years of training beyond a general dental degree in the study of tooth movement and jaw growth. It’s important to have a licensed orthodontist analyze the “forecasting clues” when evaluating a patient of any age. It is not necessary to be referred by your general dentist for a complimentary orthodontic evaluation at Greater Houston Orthodontics. Be proactive and contact our office to schedule a complimentary smile exam. If your child is not a candidate for early treatment, we will continue to monitor your child’s dental and jaw growth development in our complimentary supervisory program to determine the right time to intervene and begin treatment at the proper time.